Last year in Adelaide over a plate of Ethiopian food, MC’s Nelson Dialect and Cazeaux O.S.L.O. 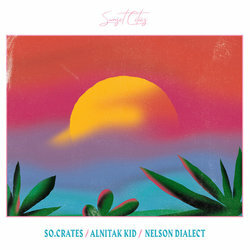 crafted the basic principles for waxing poetic over two distinct sonic dimensions - a record made up of two sides, the first produced by Melbourne beatmaker Skomes (known for his work with Caseaux O.S.L.O under the moniker SO.Crates) and the second by Adelaide resident Alnitak Kid. The record follows the cycle of the sun, no beginnings and no endings, just answers to this and many other questions using the voice, the drum and the body electric. Sunset Cities is a new musical project created to explore this and many other questions concerning one’s own presence, spiritual essence, belief, love, and mindfulness while in rotation around the life light. The group is comprised of two emcees and two producers; four human perspectives judging the light and the dark of life, manoeuvring between the two while the fundamentals of hip-hop culture and psychedelic soul simmer on the coasts of South Australia. ‘Black Tapes’ is a Neo-spiritual celebrating and lamenting the deep impact technology has on the state of our innocence. For Cazeaux O.S.L.O. as a kid VHS tapes were his campfire, his elder scroll, his suburban electric prophecy. For Nelson Dialect these black rectangle time capsules captured a lot of his imagination and different exposure to music, sport, film and art.